Canare GS-6 Guitar/Keyboard/Instrument Cable is ultra flexible with OXYGEN FREE Copper conductor and shield. Stranded Center Conductor Coaxial construction keeps GS-6 flexible even in sub-zero weather, and offers reduced Microphone handling noise and low capacitance and resistance. Great for electronic instruments, hi-fi interconnects, test probes, audio patch cords and amp to cabinet leads. 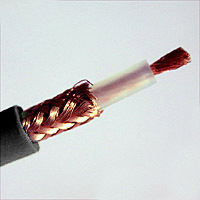 Conductor: 18 AWG, 127 strands of Oxygen Free Copper for flexibility and expanded frequency response. Dual Shield: >::92% OFC High-density Braid and special proprietary polyvinyl carbon sheath. Chan. DC Resistance: <::5.6 ohms/1000 ft.
Shield DC Resistance: <::7.6 ohms/1000 ft. Available Jacket colors: Black, Blue, Red, (Special Order - Orange). For CUTS : 50" minimum lengths for single channel cable.